The legendary rivalry between Puerto Rico and Mexico will have another chapter tomorrow, Saturday, May 19 at Pedro ‘Perucho’ Cepeda de Cataño Park as part of an event promoted by Fresh Productions Boxing. In today’s weigh-in, held at Puerto Rico’s Professional Boxing Commission, Puerto Rican Subriel Matías (9-0, 9 KO) and Mexican Adrián ‘Diamante’ Estrella (28-1, 24 KO) complied with the scale weighing 139 and 138 pounds respectively. “Tomorrow Puerto Rico and the world will know that Subriel Matías is a super prospect,” said event promoter Juan Orengo of Fresh Productions, “This fight was made well in advance for both fighters to demonstrate their best skills in the ring. The fans will be the winner at the end of the night”. With only 9 fights in his professional history, Matías has convincing victories by way of the knockout over world title challenger Daulis Prescott of Colombia, former Olympian Patrick Lopez, rising prospect Jeffrey Fontánez of Puerto Rico and the strong Brazilian puncher Joaquim Carneiro. Estrella, on the other hand, has victories over the former world champions Celestino Caballero and DeMarcus Corley and over the world title contenders, Balweg Bangoyan and Dante Jardón. Derrieck Cuevas (16-0-1, 13 KO) weighed 153 pounds and the Mexican Jesus Alvarez (15-4, 11 KO) weighed 154 in a duel to 8 rounds. Nestor Bravo (12-0, 8 KO) weighed 136 pounds and the Colombian Jean Sotelo (26-15-2, 16 KO) weighed 135 in 8-round bout. At bantamweight – 4 rounds, Jonathan ‘Bum Bum’ Lopez (2-0, 2 KO) of Humacao and Frankie Santiago (1-1) of Dorado each weighed 118 pounds. 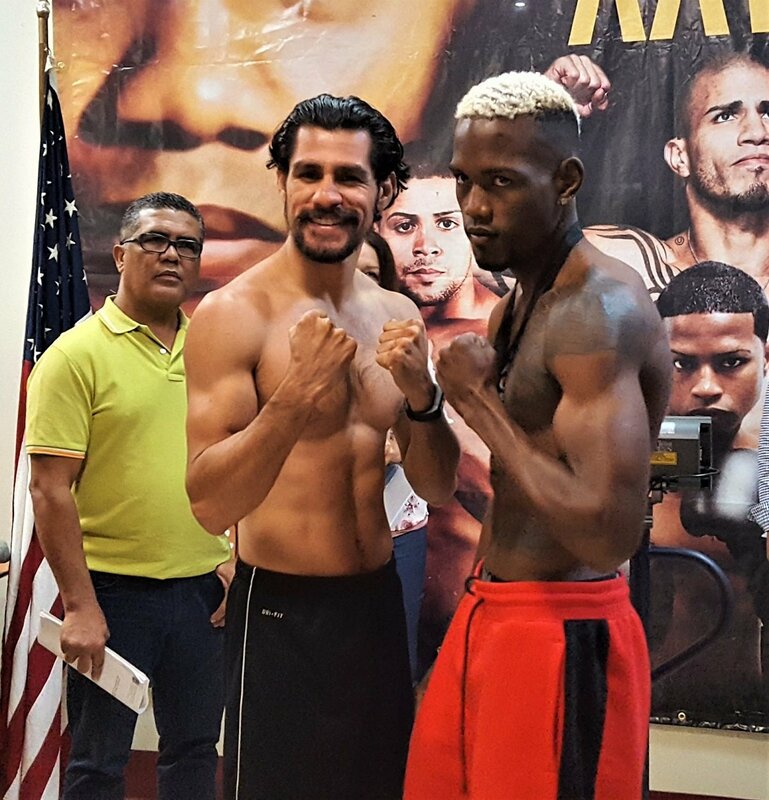 In the 110 pounds and six rounds, Óscar Marrero (2-1, 2 KO) of Luquillo weighed 109 pounds and Alexis Díaz (1-17-1) of Trujillo Alto weighed 110. In the maximum weight of 149 pounds, Alberto Amaro (6-6, 2 KO) weighed 148 pounds and Heriberto Salamán (0-3) of Carolina weighed 149. Super featherweights, Michael Adorno (2-0, 2 KO) of Vega Alta weighed 130 pounds and José Luis Cortés (0-1) of Aguadilla weighed 129. In duel of debutants Luis Enrique Rivera de Cataño weighed 137 pounds and Joshua Mercado of Dorado weighed 140.